‘Tis the season for publicity stunts, or so it would seem. 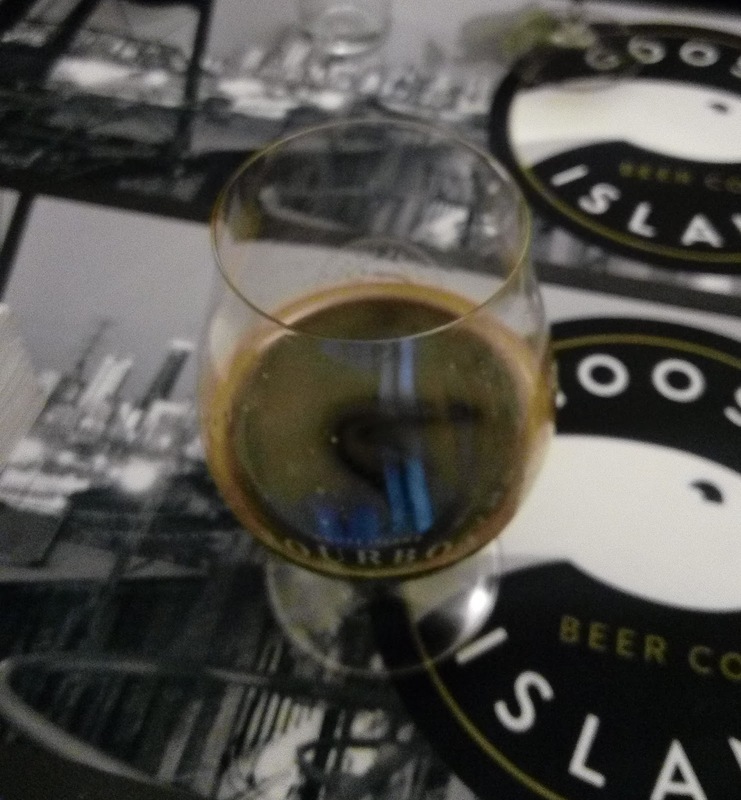 Tomorrow at 11am, the UK’s entire allocation of Goose Island’s Bourbon County Brand Stout – just 100 bottles – goes on sale at Clapton Craft’s shop in London’s Kentish Town. In the US this beer is legendary for attracting long queues of eager buyers when it goes on sale on their 'Black Friday', and Goose Island is hoping to create a similar effect here. That’s why it hosted a launch party last night in trendy Shoreditch, with brewer and barrel-ageing expert Tim Faith visiting from Chicago. 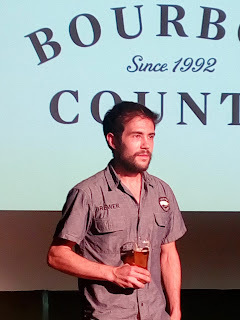 He treated beer writers and other guests to samples both of last year’s and this year’s BCBS – the latter on tap, with only a single solitary bottle present, mainly for photographic purposes. The irony is that while the bottles will be priced at £20 each, the total value of the UK’s allocation must be many times less than the cost of the launch party. To be fair though it was also the UK launch for Goose’s Winter Ale, plus it’s all part of a long-running charm offensive, as Goose owner AB-InBev seeks to build up its craft beer sales here via Pioneer Brewing Co, its UK distribution subsidiary. Tim first ran us through the history of BCBS, originally the celebratory 1000th brew at the original Goose Island brewpub. 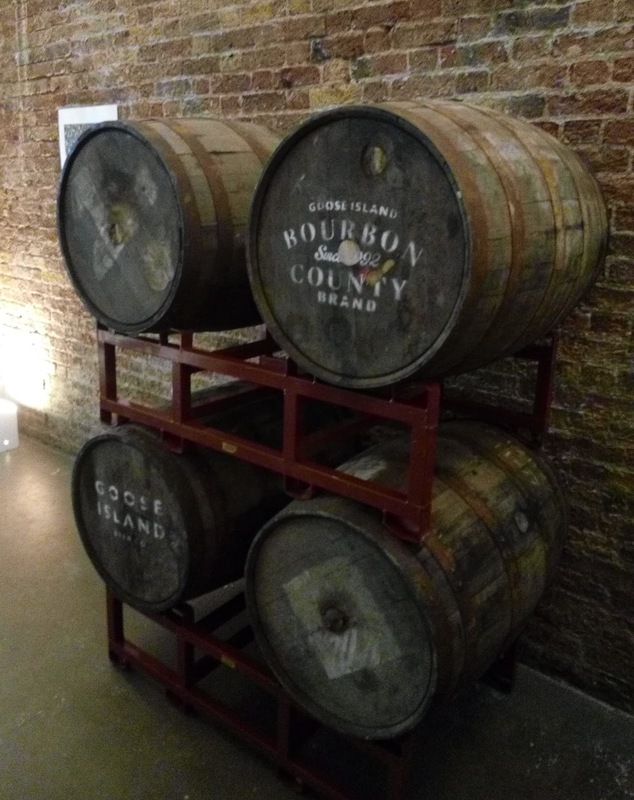 It was the first beer to be matured in Bourbon barrels with the intention of picking up the remaining whiskey flavours – the barrel-aging also adds a couple of % to the 11.5%-12% it’s brewed to. The barrels dramatically change the beer’s flavour, as it smoothes out the bitterness and picks up notes from the wood sugars, the charred lining and of course the Bourbon, and the result has been hugely popular – Tim said they brew it throughout the year now to meet demand, blending each year’s older and younger barrels for bottling at an average age of 10 or 11 months. It’s not all been plain sailing though. For one thing, I heard that while there were still queues, it didn’t immediately sell out last year and was still available a while later, perhaps because of that increased production. 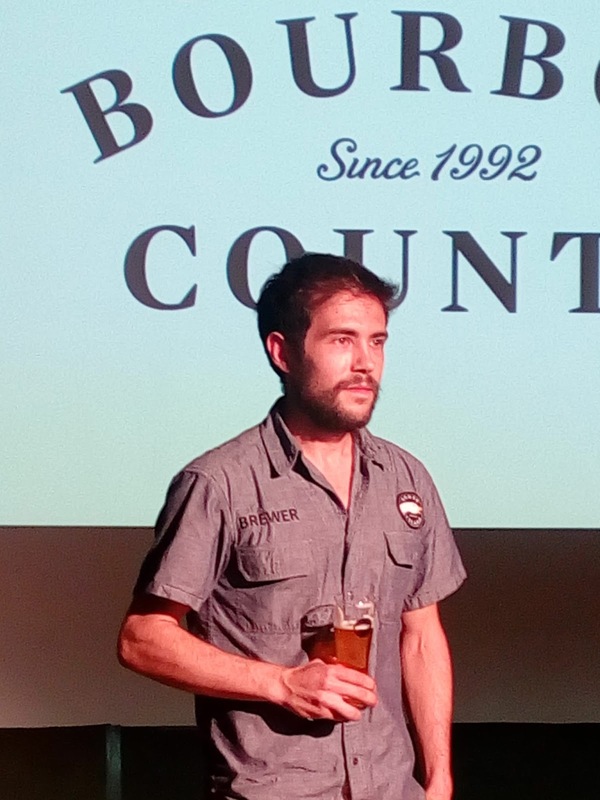 More importantly though, several 2015 batches of BCBS suffered from infection (or more accurately ‘contamination’, said Tim, who is a microbiology graduate) with an alcohol-tolerant lactobacillus bug. 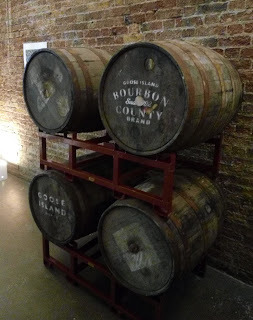 This seems to have got in while the barrels – they use thousands a year, mostly from Kentucky’s Heaven Hill – were in storage prior to filling with stout. The problem was that this bug is a late starter, so the beer tasted fine before bottling, and the off-tastes didn’t appear until later. Goose’s response was two-fold: refunds to buyers, and a decision to stabilise the 2016 edition before bottling by pasteurising it. The latter attracted a lot of criticism, with some saying they wouldn’t buy pasteurised beer. For now, the 2016 stout is gorgeous – it’s rich and thick, with oak and umami notes, a light bitterness and warming alcohol to counter the sweetness. What’s unclear is how – or indeed if at all – it will age in the bottle. As an example of the latter process, a friend who’d also tried the 2015 back in February confirmed that it’s changed significantly since then. The 2015 version we tried was not as thick as the 2016 but was perhaps a bit more complex – after a year in bottle it has a startlingly strong coconut aroma, plus I detected notes of vanilla, cocoa, old leather and dried fig. I can’t help wondering if the 2016 is really worth £20 a bottle tomorrow, especially when it is only $10 or so in the US and when there are other excellent Imperial Stouts around now. On the plus side, there’s not many others at 14%, BCBS is something of a legend, and there should be a bit of a fuss made for those willing to queue up in advance at Clapton Craft tomorrow – I can't say what, but in the US you might get coffee and doughnuts for example, maybe with brewery swag too for the first few in the line. One thing I do know is that Tim's due to be there tomorrow morning, so if you want to meet the brewer before he flies home, this could be your chance! I received an invitation to the event, but couldn’t make it unfortunately. It looks as though I missed an interesting evening; but I don’t somehow think I’ll be forking out twenty quid for a bottle – if there’s any left in the shop, of course.